Jay Jennings is a Los Angeles native who graduated Beverly Hills high school and studied film production at Columbia College of Film in Hollywood. Jennings is a screenwriter and filmmaker by profession, having directed a few features and many short films over the past 10 years. He's been collecting Knott's Berry Farm memorabilia for almost 40 years now and is currently working on a documentary about the history of Knott's Berry Farm and it's founder, Walter Knott. You can check out Jay's memorabilia collection here. ephemera: My wife loves Knott's Berry Farm. She was excited to hear I was interviewing you for the blog. 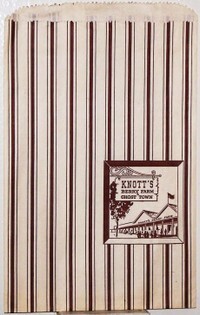 When did you become interested in Knott’s ephemera? Jennings: I started going to Knott's Berry Farm in 1969 when I was very young and whenever we went on a family trip there, I would always save a souvenir to remember my visit--popcorn bag, menu, brochure, etc..., and I did that for many years throughout my teens and up until adulthood. In the last 20 years, I've really started to collect Knott's ephemera with a sense of purpose. The reason is, unlike the huge world-wide following that Disneyland has attained over a 50 year period, including it's huge array of collectibles and ephemera, I discovered, much to my dismay, that there really wasn't a big market for Knott's collectibles, let alone any preservation society that was dedicated to preserving the 80+ year history of Knott's Berry Farm-- the exception being the Orange County Archives recent acquisition of vintage Knott's newspapers and photographs. So I have taken it upon my self to collect as much Knott's memorabilia and ephemera as I can--menus, tickets, brochures, postcards, snapshots, guides and envelopes--mostly for historical purposes, and of course, because I truly enjoy collecting Knott's Berry Farm ephemera. The artwork on these items certainly reflected their eras--1940's, 50's and 60's--with a distinct sense of style, and always with an Old West theme. ephemera: That's the true spirit of ephemera collecting, Jay. What challenges or obstacles do you encounter in collecting? How do you overcome these challenges? --have definitely helped me find what I've been looking for. ephemera: You have an excellent strategy--something I think others can apply to their unique ephemera collecting challenges. What are your favorite items in your collection? Jennings: As far as ephemera goes, I have a wide selection of favorites, mostly from the 1940's and 50's, including my collection of vintage Knott's menus, where not only can you see how the food items and prices change over the years, but you can actually see what attractions were featured at the farm for that particular year. 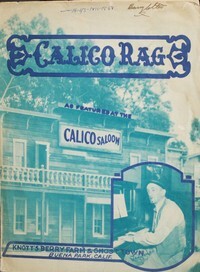 Knott's menus also featured great covers with color photos inside, as well as, employee profiles and a map of how to get to there. Another favorite is a 1950's Knott's restaurant table mat with four different sketches by Knott's artist and Ghost Town designer, Paul von Kleiben. 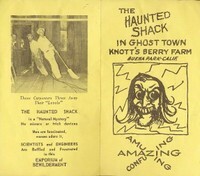 A third favorite of mine would be a small 1950's brochure from the Haunted Shack, which was this four-sided leaflet that explained the history and mystery of one of Knott's Berry Farm's most beloved attractions, which was sadly torn down in 2000.
ephemera: These are great items. I had no idea that Knott's had such cool stuff associated with it. What’s your advice for achieving success as a collector? Jennings: I'd say that once you start collecting, stay with it and don't give up, even if you go through dry spells and you can't find what you're looking for. Sometimes finding what you need can take months and even years, but you should always be on the look-out for collectibles that are related to, or have something to do with your particular area of collecting. Also, don't stray away from your main interests and start going off in different directions. Stay focused and don't spend all your money on one great item. Instead, for the same price, buy a bunch of items, that way, in the long run, you'll have more of a collection to show for. ephemera: If someone wanted to join in the fun of collecting Knott's ephemera, what resources and tools do you recommend? Jennings: There are many more resources today for people who collect stuff than there were 10-20 years ago. There are tons of magazines and books on collecting--both online and in hardcopy--plus you can also do Internet Web searches for collectibles and people who sell them. Depending on what you collect, conventions and paper shows are more popular than ever as well. As far as tools of the trade go, I highly recommend putting all paper collectibles and ephemera in plastic sleeves with cardboard backing, so they don't bend. You can either put these sleeves all together in a three-ring binder scrapbook, or you can store them individually as separate pieces. ephemera: Thanks, Jay. I'm sure this interview will bring back a lot of fond memories of days spent with family and friends at Knott's. Thanks for sharing your collection and your expertise on collecting. I grew up in Buena Park and worked at Knott's Berry Farm in college, but the only memorabile I think I've hung onto all these years is my nametag. I'm glad there are people out there trying to preserve some of the KBF history with ephemera; I'd always just assumed there was some storeroom or *something* where they had such things. The chicken dinner restaurant has some old menus and stuff on display, I think, or they used to. Great article. I have been following Jay's blog for a while now and it was cool to hear his thoughts on how he collected so much Knott's memorabilia! When I was a kid in Ohio...over 40 years ago...my neighbor traded me my 1955 double dye penny for an old Knotts Berry Farm western cowboy decorative box. When I first arrived in California in 1979, I searched the Knotts Berry Farm Museum for something like my box...Ther was no match. Last week my friend from Ohio visited me (I live in the LA area) and we checked again at Knotts...no match and the lady who was working at the museum said that she had not seen onbe like it. My friend suggested that I put it on Ebay. Are you interested? I just picked up a "Story of Knott's Berry Farm and Ghost Town" at an estate sale. It is in really good condition. I didn't realize how rare it is until I tried looking up a price for it. If I were to sell it, how much would it go for? My grandfather worked for Knott's he was the original "olf timer" panning for gold at the mine and Judge Roy Bean. My grandmother sewd for Mrs. Knott and my mom picked berries at the farm in Buena Park. I have postcards and other pictures of my grandfather Tyson L. Bean working at the farm. I just unearthed a Knott's Bonanza Fun Book #343948 from a coin collection that my Grandmother left me. It appears that all of the ticket's are still in it as well. Does anyone know if this is a collectible piece? I have found a knotts farm baby spoon and fork. Both measure about 2 1/2 inches long. Ive had them since I was a kid and just recently researched them. The box has never been opened. The tiny silverware is in a white plastic box from Japan, with red lining on the inside. The "Knott's" symbol is on the handle of both of the items. And there is a 4 digit number on the knotts tag on them back. Does anyone know if this is a collectible. Ive found a Knotts baby spoon and fork in their original white plastic box. Do i have a collectible? My dad and Uncle used to ride into Knotts on there horses and sign autographs. They were the "pistol packin papa's" in the 50's I have a copy of the news article on them if you would like to see it. My dad is Bob LaMar and Uncle is Larry LaMar. My dads branding Iron was also made there, and was over the blacksmiths door for years, till they changed it. Valentine's Day Antique Fan Happy Valentine's Day! To celebrate, I'm featuring this antique Valentine's fan card. For those who love hand-held fans like this one, check out my interview with a collector of vintage fans.